A mullet hairstyle is short on the front and sides of he head, and long in the back. 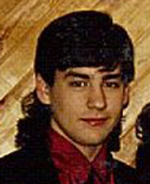 The word "mullet" was popularized by the Beastie Boys, a US hip-hop band; whether they coined the word is up for debate. There are many different varieties of mullet, ranging from something like a layered haircut (with short layers on top of the head) to a crew cut with a long tail of hair extending down to the middle of the back. The look was first seen in 1960s America, though it remained marginalized until the 1980s, when "hair-metal" and "glam-metal" bands began teasing and perming their hair into high-maintenance mullet hairstyles. 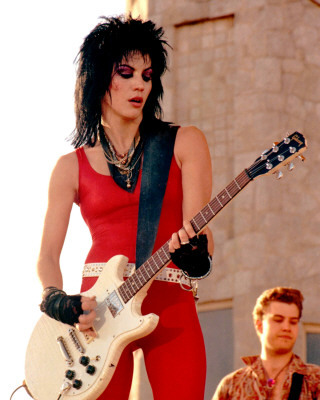 Musicians like Axl Rose, Jon Bon Jovi and Joan Jett all wore big hair which was short on top, and about shoulder-length on the back. Today, this hairstyle is strongly associated with white working-class culture, heavy metal fans and lesbians. The mullet is therefore not seen as glamorous or desirable. Its reputation worsened, if anything, when hipsters began wearing mullets in the mid-00s. This haircut is likely to get a strong reaction from other people, from ironic enjoyment on one side to disgust on the other. I know of at least one poetry website dedicated to the mullet hairstyle. To some people, a mullet reflects a sort of "who cares what other people think?" attitude that they envy or aspire to. However, a mullet does look good on some people. Even if the permed mullet is permanently out of fashion (knock on wood), people with straight or wavy hair can wear an updated version of Ms. Jett's hairstyle (see above photo), with short, layered hair framing the face, and shoulder-length hair at the back. This haircut looks best on handsome people with dark hair. I'm not sure why. My educated guess is, dark hair frames the face and draws attention to it. When the person has a nice face, and when the cut flatters their face shape, the class implications of the hairstyle no longer matter. For those with lighter hair, or less than stunning features, the mullet is a bit of a gamble.